The Koren Ani Tefilla Weekday Siddur is an engaging and thought-provoking siddur for the inquiring high school student and thoughtful adult. 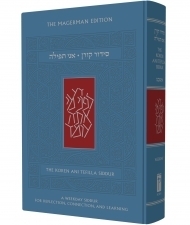 The innovative commentary in this siddur, for beginners and the seasoned alike, has been designed to help the user create their own meaning and connection during the Tefilla experience. Divided into different categories that enable the user to connect to the liturgy in different ways, the commentary provides a variety of approaches to each tefilla, and something meaningful for everyone.